Located near Grand Central Station in New York, D’Espresso attracted a lot of media attention for its unique interior design. Inspired by the nearby Bryant Park Library, Manhattan based nemaworkshop designed the interior to look like a library turned on its side. The floor, ceiling and one side of the wall are lined with tiles with full size photograph of books. 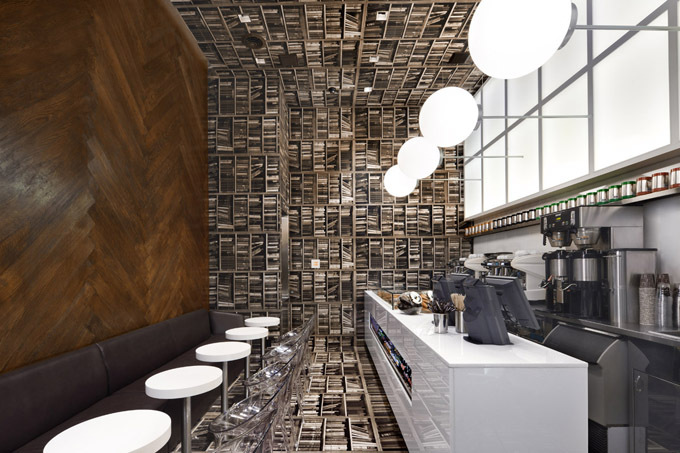 One of the walls is covered with herringbone-patterned oak flooring while the opposite wall has lights sticking out from the side to look like the ceiling. The owner Eugene Kagansky spent $500,000 to create the imaginative interior of this 500-square-foot coffee shop.